Be the first to share your favorite memory, photo or story of Rogna. This memorial page is dedicated for family, friends and future generations to celebrate the life of their loved one. 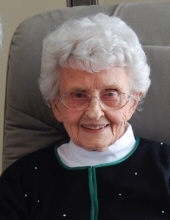 Rogna Hewitt, of 1405 7th Street South, Moorhead, Minnesota died Friday morning March 29, 2019, with her children at her side. Rogna’s children and extended family appreciate the support provided by the staff at Eventide and Ethos Hospice. Rogna was born February 17, 1918 on the farm her father homesteaded in 1889. She was the daughter of Christ and Olina Solberg. She attended school in Baker, North Dakota. Upon graduating from high school Rogna entered nurses training at the Good Samaritan Hospital in Rugby, North Dakota, earning a RN degree. She served in the Army Nurses Corps in WW II until her marriage to Ted. On September 12, 1942 Rogna and Ted Hewitt were married in Moorhead. They farmed near Forman, North Dakota for two years, and then moved to Fargo were Rogna worked was an RN in the hospital and Ted joined the police department. Rogna’s career was dedicated to the care of others and included private duty nursing, public health nursing as well as caring for family and friends. After retirement Rogna and Ted moved to Glyndon, Minnesota where they fulfilled their dream of owning a hobby farm. They enjoyed 17 happy years there, creating a place where all were welcome to have a meal and or spend a night exchanging stories. Rogna’s life spanned 101 years, and was characterized by a determination to be and do the best she could. Rather than material things, her focus was on maintaining connections with extended family and friends, initially by exchanging letters using regular mail and later by learning how to use/send email. Rogna was preceded in death, by her parents, 11 siblings and husband. She is survived by her sister-in-laws Jane Delvo (Jack), Marge Hewitt (Cod), daughter Roxann Haggerty (Bill), son Jay/Tom Hewitt (Nana), and numerous grandchildren, great grandchildren, and extended family. There will be a celebration of Rogna’s life with a memorial service on April 27th at 1:00 PM in the community room at Eventide located at 1405 7th Street South, Moorhead, Minnesota. Friends and family are invited, and refreshments will be served afterwards. Inurnment will be at St. Petri Lutheran Cemetery, York, North Dakota. To plant a tree in memory of Rogna Hewitt, please visit our Tribute Store. "Email Address" would like to share the life celebration of Rogna Hewitt. Click on the "link" to go to share a favorite memory or leave a condolence message for the family.